The 1991 ADA Standards were in effect until March 14, 2011. The 2010 Standards are the current enforceable accessibility standards. The Department of Justice published the Americans with Disabilities Act of 1990 (ADA) title III regulations, which included the ADA Standards for Accessible Design (1991 Standards), on July 26, 1991. The Department of Justice published revised regulations for Titles II and III of the ADA in the Federal Register on September 15, 2010. 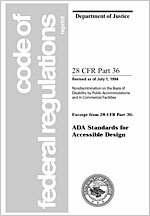 These regulations adopted revised, enforceable accessibility standards called the 2010 ADA Standards for Accessible Design (2010 Standards) and permitted the 1991 Standards to be used until March 14, 2012. If you have questions about the ADA Standards and want to talk to a Department of Justice ADA Information Specialist, go to the ADA Information Line page for the Department's toll-free telephone numbers and times of operation.